This kit includes everything you need for smooth, powerful CNC motion control of your 4-axis or dual-drive 3-axis machine! The perfect setup for rack and pinion or other dual-drive machines, this bundle features a set of components designed and tested to work together for great machine performance. The MX4660 is our preferred stepper motor driver solution for 4-Axis DIY NEMA 23 CNC electronics. Offers the latest Digital Signal Processing (DSP) technology for high precision, excellent torque, extra low noise, very low motor heating, and smooth motor movement. Pin to pin compatible with older analog multi-axis drives (like the Gecko G540). Our 420 oz-in motors with 3/8" shafts come standard with this kit; our 380 oz-in motors with 1/4" shafts are also available (choose Motor Shaft Diameter below). Both motors are specifically optimized for CNC operation - don't get caught up in the stall torque game, your motors don't run at stall! 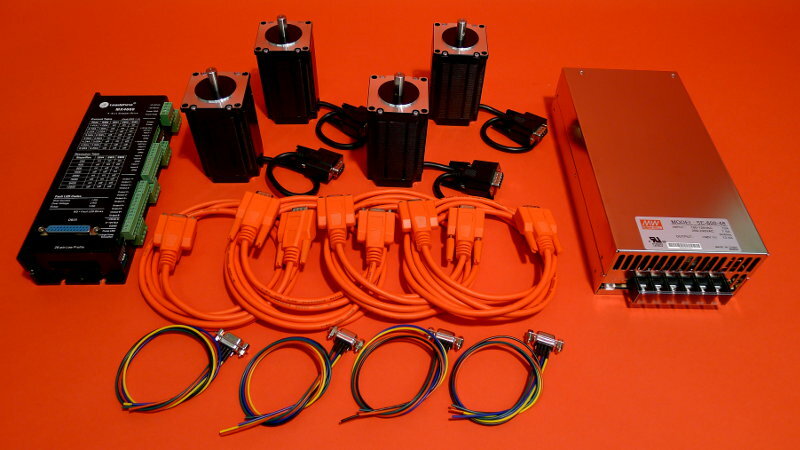 Available in various length configurations to fit your machine (choose Cable Configuration below). Need longer cables? Our cables are designed to plug together, just order additional cables as needed to get the length you need for your larger format machine. The Ethernet SmoothStepper is our preferred solution for the ideal CNC controller experience, and we strongly recommend including it with this CNC electronics kit. In addition to enabling the use of Mach3 with any modern PC/laptop that lacks a parallel port or runs a current 64-bit version of Windows, the Ethernet SmoothStepper provides a more reliable and robust communication path between your PC and CNC electronics. It solves or greatly reduces most potential Windows-related communication issues by providing a dedicated real-time DSP (digital signal processor) to handle the precise timing of step and direction signals, and supports up to (3) 25 pin ports worth of IO (simulating 3 parallel ports). If you are looking for a turn-key CNC electronics solution, our Plug and Play NEMA 23 CNC Control System is a complete, pre-wired system installed in an industrial steel NEMA enclosure, and offers significantly upgraded components and expanded capabilities. The Ethernet Smoothstepper Software Setup Guide provides additional instructions for setting up your PC and the Mach3 controller software with this electronics kit (when equipped with the Ethernet Smoothstepper). Mach3 XML Configuration Files are available for this kit, providing pre-configured settings for use with our CNC machines. Feel free to contact us if you have any questions about hooking things up. We're always happy to help! This product was added to our catalog on February 7, 2010.